There's a new C64 game to play and this one is a work in progress early access game called ' Velcro ', which was developed by Wilfried Elemreich for the create a game #bitbitjam4 2017. 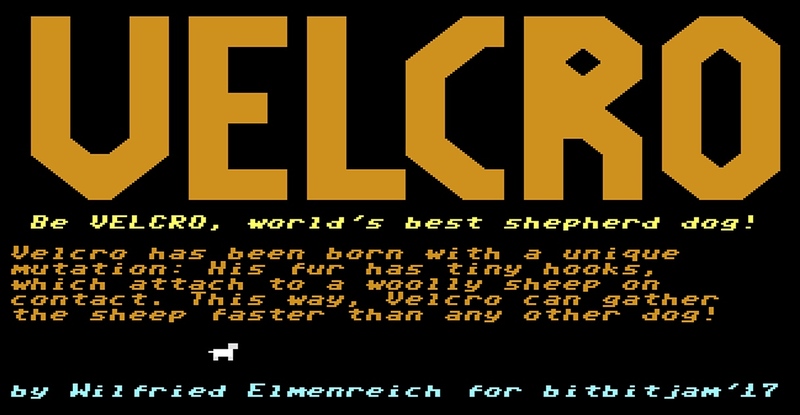 In this game you play as the lovable sheepdog Velcro, a dog which has been born with a rather awesome mutation giving him the ability to attach himself to woolly sheep on contact, using tiny hooks grown through his fur. So no longer does he have to round up the "baaaah", he simply has to touch them all and bring them back to the farm. Designed as a one touch game, with only the spacebar to redirect your circling doggy, Velcro is a game that is really good fun to play even at this early stage with no music or sound. It takes some skill to make sure your dog goes in the right direction, but once you get the hang of it, you'll be attaching yourself to the required sheep in no time and completing all the levels, which become ever more difficult as you progress. So good luck, but watch out for the snakes, they bite!